LDT Nagold honors Werner Böck. Werner Böck, Chairman of the Supervisory Board and majority shareholder of MARC O’POLO, was the first representative of the fashion industry to be awarded the LDT Award last Friday. With this special award LDT Nagold honors the work of Werner Böck for the academy. For several years, the entrepreneur, who himself is alumni of LDT Nagold, has been supporting the textile and clothing school with MARC O’POLO in a variety of ways. In addition to the partnership for the cooperative degree program, the commitment includes, among other things, the offer of regular order training and excursions to the headquarters of the Premium Modern Casual Brand as well as the participation in the advisory board of LDT Nagold. Besides honoring his commitment to the academy, the award aims at highlighting the creativity and innovative spirit of Werner Böck, who over the past decades has positively influenced not only the development of MARC O’POLO but that of the entire industry. 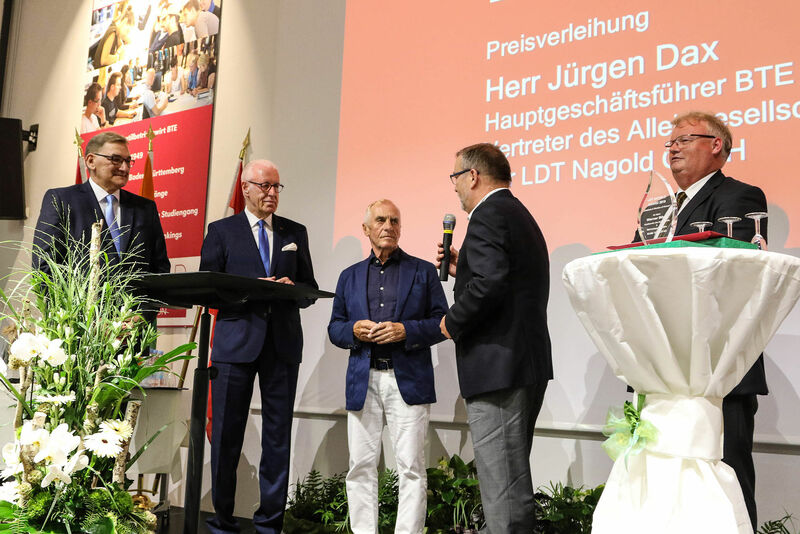 The presentation of the LDT Award took place within the graduation ceremony at LDT Nagold last Friday, July 20th, 2018. The award "Graduate & Member of Honor" includes the placement of a portrait as well as the personal motto of Werner Böck - "if you want everything to stay as it is you need to keep changing something." - in the auditorium of the textile and clothing school. Werner Böck is the first to receive the LDT Award from LDT Nagold.